Did the United States Army do everything that it could to protect the Chosen Company's Second Platoon? Col. BROSTROM: ...get everything that this great country can provide to protect them. Ms. CARLENE CROSS: This situation was pure recklessness. Mr. KURT ZWILLING: Bad things happen in war. Mr. ZWILLING: But our boys are not cannon fodder. The United States has to protect these men. And in this case it was not done. RICHARD ENGEL reporting: Every parent who sends a son or daughter to war knows the worst can happen. But that deep, often unspoken fear is tempered by a faith that the military won't needlessly risk the lives of their loved ones. Ms. MARY JO BROSTROM: You son takes off, but he's coming home. I never imagined that he wouldn't. Ms. BROSTROM: I always thought that Jonathan would always be coming home. He was Jonathan . ENGEL: Jonathan , Jonathan P. Brostrom , a 24-year-old Army second lieutenant from Honolulu , Hawaii . Col. BROSTROM: Well, he was your typical American boy . Very athletic. Col. BROSTROM: Had lots of friends. ENGEL: You might say the Army was in Jon Brostrom 's DNA . His father, Dave , was Army strong long before the ad campaign. Col. BROSTROM: It's a great institution. Col. BROSTROM: I spent my whole life in the Army . ENGEL: Dave Brostrom was a career officer who retired as a colonel after 30 years. When Jon was in high school , the Brostroms moved to Hawaii . It proved a tropical paradise for an adventurous kid. ENGEL: One of the great joys of Jonathan 's life was his son Jase , who lived with his mother on the mainland. Jon loved to surf with his boy. At the University of Hawaii , Jon joined Army ROTC . His parents were with him every step of the way. Col. BROSTROM: He grew up as a military brat. Col. BROSTROM: He tried to follow in my footsteps. Made me very proud. ENGEL: Jon volunteered for the infantry. That choice surprised his parents, especially Dave , a helicopter pilot who had commanded an aviation battalion in Desert Storm . Col. BROSTROM: When he said, `I'm going to be in an infantry,' I kind of cringed. Ms. BROSTROM: We tried to talk to him out of it. ENGEL: So he wanted to be in the fight? Ms. BROSTROM: He wanted to. ENGEL: At the front line ? Ms. BROSTROM: At the front. ENGEL: After being commissioned as a second lieutenant, Brostrom was assigned to the 173rd Airborne . His dad pulled a few strings to get him into the elite paratrooper unit, which was commanded by an old family friend. In the fall of 2007 , the newly minted officer was sent to Afghanistan . Col. BROSTROM: He called and said, `I got my platoon.' I was -- I was excited because that's where you start your career. Lieutenant JONATHAN BROSTROM: Just another day at the office . Unidentified Soldier #2: Ow! OK! ENGEL: That's Pruitt Rainey of Haw River , North Carolina , an all-state high school wrestler, and training to be a mixed martial artist. Rainey impressed his unit early on with his strength and his uncanny gift for poker. Mr. FRANKIE GAY: And when he wasn't fighting or wasn't on duty, he was playing poker. ENGEL: ...a game he learned from his father. Mr. GAY: ...during the games so I could talk with some of the other guys. Unidentified Soldier #3: OK, here's Bogar . ENGEL: Jason Bogar , quieter and more introspective than most of his comrades, was on his second Afghan tour. He'd also served in Iraq and done hurricane relief in New Orleans . An accomplished photographer, Bogar e-mailed his photos and videos to his mom in Seattle . Ms. CROSS: Incredible pictures of the people and the surroundings. Ms. CROSS: And then he would put these videos together with music and they were incredible. ENGEL: Some of the videos like this one gave an idea just how tough life was in the Afghan mountains for Lieutenant Jon Brostrom 's men. Comic relief was provided by a genial born-again Christian from Tennessee named Jason Hovater . Offscreen Voice: How do you feel now? Ms. JESSICA DAVIS: He was the life of the party . ENGEL: According to his sister, he had always been funny. ...he would make everybody laugh. Corporal JASON HOVATER: Staying in the rock is a big deal for this battalion. Corporal GUNNAR ZWILLING: I love Black Hawks . They're so black and powerful. ENGEL: In the close-knit family of 2nd Platoon , Gunnar Zwilling was their little brother. Mr. ZWILLING: They were as close as I was to him. ENGEL: Gunnar 's dad say his son was thrilled to be part of Chosen Company . Mr. ZWILLING: He was there for one reason. He was there for his guys. Mr. ZWILLING: When you live with somebody and go through as much as they go through together, you learn to love each other like brothers. ENGEL: Brostrom 's platoon was based in mountains that cover the provinces of Nuristan and Kunar . 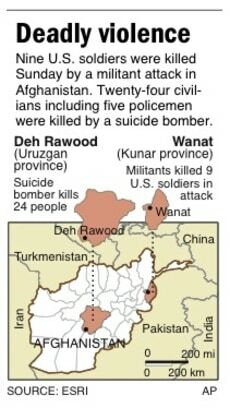 The area was mainly controlled by insurgents. Col. BROSTROM: I knew that he was probably in firefights. Col. BROSTROM: But he didn't -- when he called us, he didn't, he didn't talk about any of that. ENGEL: No indications that he was in danger? ENGEL: He seemed calm and excited about the mission? Col. BROSTROM: We were happy and proud. We still did not know what was going on. ENGEL: Jon Brostrom wasn't telling his parents how dangerous eastern Afghanistan really was for him and for his men. Sergeant BRIAN HISSONG: It was basically just walking around waiting to get attacked all the time. ENGEL: And as the Chosen Few were about to learn, it would soon get much worse.